after being sentenced to death. Every matter of importance in 1530′s England concerned Cromwell. 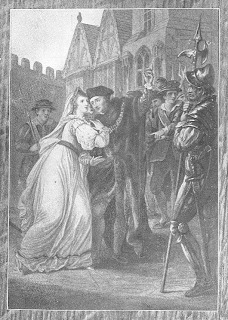 He raised and then destroyed Anne Boleyn; he managed the realm’s religious turmoil so fearsomely that his ouster was one of the demands of the Pilgrimage of Grace; he did what he had to do in the matter of Sir Thomas More. Though it may be, as Edward Hall recorded, that “many lamented but more rejoiced” at Cromwell’s fall from the very height of his power “and specially such as either had been religious men, or favoured religious persons; for they banqueted and triumphed together that night [of his execution], many wishing that that day had been seven year before” the reasons for it are murky. Why, too, should the minister have been ennobled Duke of Essex in April 1540, months after the disastrous union? That Cromwell, whose own security rested upon the stability of the realm, was a radical Protestant promulgating inflammatory religious ideas and he was condemned for both treason and heresy, incidentally giving the king wide latitude for just how painfully to kill his former servant seems to beggar belief. Oh, and by the way with the German princess on the outs, the king’s wandering eye had fallen upon a niece of Cromwell’s enemy. 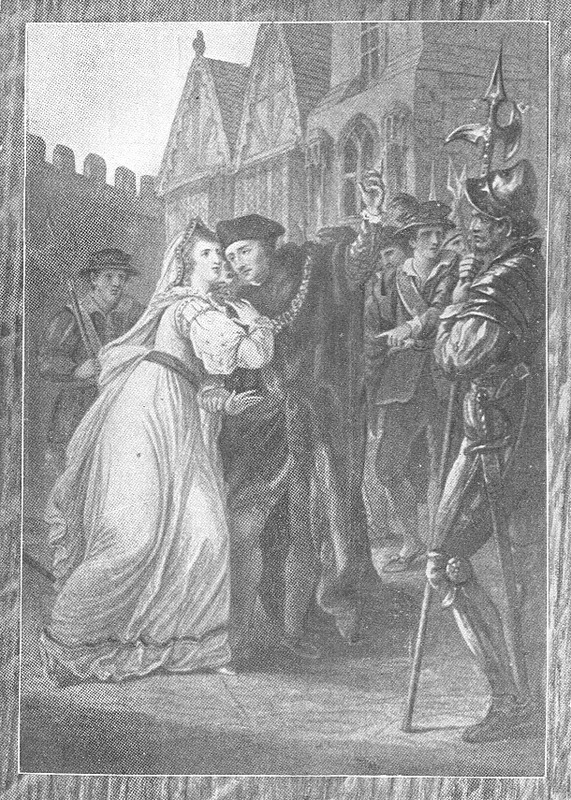 On the day that Cromwell lost his head, Henry married Catherine Howard. No matter your brilliance, in Henrican England you only had to lose at court politics once, even if the king would be lamenting this injudicious trade within months. Henry gave his loyal servant the easiest death, beheading on Tower Hill (although it turned out to be a botched job) alongside a Walter Hungerford, the first person executed under the Buggery Act. On the afternoon of Thursday, the 10th of June 1540, a squad of Yeoman of the guard burst into the Council Chamber in Westminster Hall, and arrested Thomas Cromwell, Henry VIII's chief minister. They escorted him out through a postern to a boat waiting at Westminster Steps, rowed him down the Thames, and through Traitors' Gate into the Tower of London. Within this gaunt prison Cromwell was held till the early morning of July 28th, when the Yeoman marched him to Tower Hill to be executed for treason, heresy, bribery,and misuse of power. He climbed the scaffold, and addressed the crowd. He had come here to die, he confessed, and not to justify himself. He was a grievous wretch, who sought God's pardon. He had offended the King, and asked the crowd to pray that Henry VIII would forgive him. Finally, Cromwell insisted that he would die a Catholic, and that he had never waivered in a single article of the Catholic faith. Then, after a short paryer commending his soul to the Almighty, Cromwell laid his head on the block, and, as John Foxe records, "patiently suffered the stroke of the axe" swung "by a ragged and butcherly miser (who) very ungodly performed the office." Edward Hall records Cromwell playing ball with a fine entry in the scaffold-speech genre that kept his son in the peerage. So died one of England's greatest statesmen the architect of the Reformation and the Tudor Revolution Government. Just as his career has been the source of much historical debate, the events of the last seven weeks of his life, from his arrest to his execution,and his scaffold address especially, have been an irritant of contradiction and confusion. Thomas Cromwell: A Study in Interrogation, Charles Carlton, Albion: A Quarterly Journal Concerned with British Studies, Vol. 5, No. 2 (Summer, 1973), pp. 116-127. Edward Hall, The Union of the two noble and illustre families of York and Lancaster (London, 1548), pp. 246-47. John Foxe, Actes and Monuments, ed. George Townsend, 8 vols. (London, 1834), V:402-03. So the architect of the Reformation died a self-proclaimed Catholic! Extraordinary, when you think of it. After all the suffering he caused, all the vandalism and destruction and theft of monastic lands and buildings. Tudor history never ceases to amaze, confuse and confound us! Thanks for commenting gigigirl! I'm glad you liked it! Robert, I caught that too, how do you die a self-proclaimed Catholic, if you are a Protestant? It's a conundrum or is it? Brilliantly written as usual, and comments and reviews spot-on....If I recall from the series, is he not one of the many men who falsely accused Anne Boleyn of Infidelity to the King? If that is the case....he deserved exactly what he got..But that is just my opinion...and if I am a little off here, by all means clear this up for me.. Thank you for commenting Anonymous and your generous compliments. Although, Showtime's The Tudors is not known for its historical accuracy, Thomas Cromwell was not one of the twelve men on the jury panel at Anne Boleyn's trial. However, Thomas Cromwell did plot her downfall, orchestrate her fall and execution.